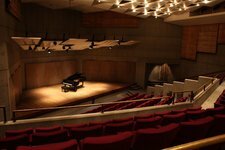 Located in the MacLaurin Building, B-Wing, at the University of Victoria, the 220-seat Phillip T. Young Recital Hall is the main auditorium for School of Music faculty and student recitals, masterclasses and rehearsals. The Recital Hall houses two Steinway concert grand pianos, adjustable lighting, and a state-of-the-art recording and streaming studio. A lobby/lounge area is available for receptions. Rental / Usage RestrictionsDue to the high demand of our facilities for internal use, we do not regularly accept external rental bookings during the months of September-December and January-April. Soundsystem DetailsNo built-in sound system. Accessibility NotesThe Recital Hall is wheel chair accessible from the main recital hall entrance for audience members and from the stage doors for backstage/stage access. Parking NotesThe Phillip T. Young Recital Hall is located in the MacLaurin Building and most easily accessible from the Ring Road by parking lots E (adjacent to the MacLaurin Building) and 6 (across the road). Parking is subject to UVic traffic and parking regulations. User-pay parking is available in all main campus lots Monday to Saturday, including evenings.